At Landmark Preschool and Ridgefield Academy, one will find a community that reinforces the importance of service to others. On Sunday, December 2 from 11am to 1pm, Landmark Preschool Westport will hold a fundraiser for Westport Uniformed Firefighters Charitable Foundation to fund the purchase of AEDs (automated external defibrillators) for Westport’s Emergency Responders. We will also be collecting toys for Al’s Angels for critically ill children. 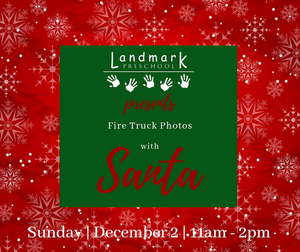 Families are invited to come to the Landmark courtyard to have a photo taken with Santa or a firefighter on a vintage fire engine. Suggested donation price is $25/child or $50/2 or more children. All proceeds will go to Westport Uniformed Firefighters Charitable Foundation. After photos are taken, children will be welcome to come indoors to warm up with a craft activity in a Landmark classroom with a Landmark teacher while enjoying a snack of cookies and hot chocolate. This event is sure to get everyone in the holiday spirit for a wonderful cause. For more information about the event, please visit here.